This is a bit of a departure for me. I've never been one for utilizing the garage for it's intended purpose. 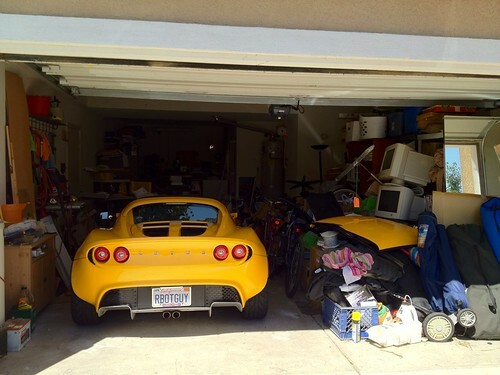 When I got married I explained to my wife "Don't ever expect to park a car in the garage" and she was OK with that. When we found this house I said "It has a 3 robot tandem garage." 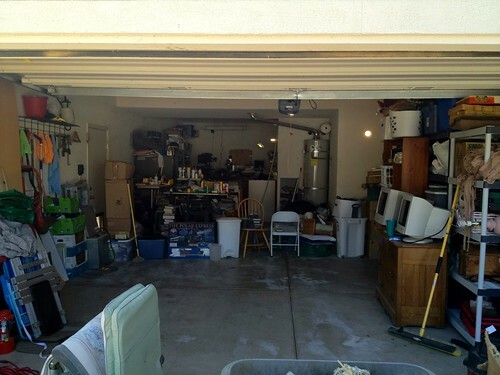 I've always left the cars in the driveway and used the garage as a shop/robotics lab. When I fell for the Elise I knew that situation would have to change. If I tried to keep Ada (that's the Elise) parked outside, I was sure I would run the risk of having the Exotics Police come and take her away from me . A couple of days after purchase I managed to scoot the woodworking tools out of the way far enough to just barely fit her in, but I had to stop in the driveway and let the passenger out because there wasn't enough room to get both doors open. Not a huge improvement, but I can get both car doors all of the way open without hitting anything, and I have a lot of garage sale items separated and ready as well as a giant pile waiting for electronics recycling. What used to be a huge pile of stuff on the right side is now somewhat more organized on the shelves and ready to evaluate. My wife has promised to help sift through 20 years of our accumulated stuff and have a yard sale with me weekend after next. These before pics are a bit embarrassing , but hopefully I can use the guilt to help keep the project moving forward. Eventually the plan is to park the Lotus on the left, have a woodshop area on the right and a robotics lab/mini machine shop in the back section. I would like to get professional epoxy flooring in all three sections. There's still a long way to go, but the first step has been taken. One question I thought I'd throw out there: Is there any way of doing overhead storage that looks really nice? I obviously have a lot of stuff to store, but none of the overhead solutions that I've seen have the finished look that I am going for. This is a great start, just take it one step at a time. Look up Garage envy on the web. they have a lot of good storage solutions. And keep up the good work. The longest of journeys start with the first small step. Forgot who said that, but it is on point. I recently cleaned out a whole section of my garage and now I am able to park my motorcycle flat against the wall and almost have enough space to park 2 cars in my garage. Overhead storage that looks nice huh? Maybe a small attic crawlspace if there is room>?